According to the Hebrew Bible, Esther was a Jewish queen of the Persian king Ahasuerus. Ahasuerus is traditionally identified with Xerxes I during the time of the Achaemenid empire, although Flavius Josephus wrote that Esther's king husband was Xerxes' son Artaxerxes. Her story is the basis for the celebration of Purim in Jewish tradition. King Ahasuerus (Xerxes I Darius I ) held a 180-day feast in Susa (Shoushan). While in "high spirits" from the wine, he ordered his queen, Vashti, to appear before him and his guests to display her beauty. But when the attendants delivered the king's command to Queen Vashti, she refused to come. Furious at her refusal to obey, the king asked his wise men what should be done. One of them said that all the women in the empire would hear that "The King Ahasuerus commanded Vashti the queen to be brought in before him, but she came not." Then these women would despise their husbands, which would cause many problems in the kingdom. Therefore, it would be prudent to depose Vashti. Many beautiful maidens were then brought before the king in order that he might choose a successor to the unruly Vashti. The King chose Esther, an orphan daughter of a Benjamite named Abihail. Esther was originally named Hadassah, meaning myrtle. She had spent her life among the Jewish exiles in Persia, where she lived under the protection of her cousin Mordecai. When Cyrus gave permission for the exiles to return to Jerusalem, she stayed with Mordecai. Mordecai was the son of Jair, a Benjamite, who had been carried into captivity together with Jeconiah by Nebuchadnezzar, King of Babylon. Mordecai became chief minister of Ahasuerus and lived in the Persian capital of Susa. One day, while sitting at the gate of the king's palace, Mordecai overheard a plot of two eunuchs, Bigthan and Teresh, to kill the king. 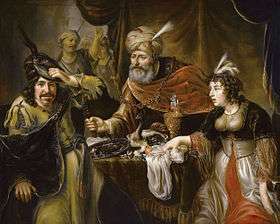 Having informed the king through Esther of the conspiracy, Mordecai brought about the execution of the two conspirators, and the event was recorded in the royal chronicles. The grand vizier, Haman the Agagite, commanded Mordecai to do obeisance to him. Upon Mordecai's refusal to prostrate himself, Haman informed the king that the Jews were a useless and turbulent people and inclined to disloyalty, and he promised to pay 10,000 silver talents into the royal treasury for the permission to pillage and exterminate this alien race. The king then issued a proclamation ordering the confiscation of Jewish property and a general extermination of all the Jews within the empire. Mordecai tore his robes and put ash on his head (signs of mourning or grieving) on hearing this news. 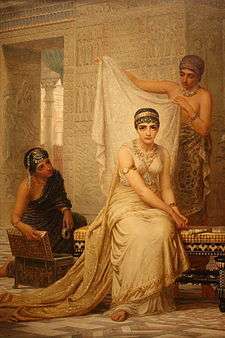 Sheltered in the harem, Esther was unaware of the decree until Mordecai advised her of it through Hathach, one of the king's chamberlains. He informed her that she should not think that she would escape simply because she was in the palace. At the request of Esther, Mordecai instituted at Susa a general fast for three days. Esther could not approach the king without being summoned, on pain of death, and the king had not summoned her for thirty days, implying that she may have fallen out of favor. Nevertheless, at the end of the three days, Esther dressed in her royal apparel and went before the king, who was pleased to see her. When the king asked her what her request was, she invited the king and Haman to come to a banquet she had prepared. At the banquet they accepted her invitation to dine with her again on the following day. Haman, carried away by the joy that this honour gave him, issued orders for the erection of a gallows on which he intended to hang the hated Mordecai. But that night the king, being sleepless, ordered the chronicles of the nation to be read to him. Recalling that Mordecai had never been rewarded for his service in revealing the plot of the eunuchs, he asked Haman, the next day, to suggest a suitable reward for one "whom the king desired to honour". Thinking it was himself that the king had in mind, Haman suggested the use of the king's apparel and insignia. These the king ordered to be bestowed on Mordecai. 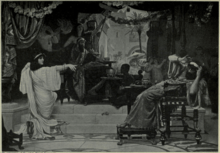 Esther denouncing Haman by Ernest Normand. Only at the second dinner party, when the king was sufficiently beguiled by her charms, did Esther reveal for the first time her identity as a Jew, and accused Haman of the plot to destroy her and her people. The king ordered that Haman should be hanged on the gallows prepared for Mordecai, and, confiscating his property, bestowed it upon the intended victim. The king then appointed Mordecai as his prime minister, and issued a decree authorizing the Jews to defend themselves. It has been conjectured that the name Esther is derived from a reconstructed Median word astra meaning myrtle. An alternative view is that Esther is derived from the theonym Ishtar. The Book of Daniel provides accounts of Jews in exile being assigned names relating to Babylonian gods and "Mordecai" is understood to mean servant of Marduk, a Babylonian god. "Esther" may have been a different Hebrew interpretation from the Proto-Semitic root "star/'morning/evening star'", which descended with the /th/ into the Ugaritic Athtiratu and Arabian Athtar. The derivation must then have been secondary for the initial ayin to be confused with an aleph (both represented by vowels in Akkadian), and the second consonant descended as a /s/ (like in the Aramaic asthr "bright star"), rather than a /sh/ as in Hebrew and most commonly in Akkadian. Wilson, who identified Ahasuerus with Xerxes I and Vashti with Amestris, suggested that both "Amestris" and "Esther" derived from Akkadian Ammi-Ishtar or Ummi-Ishtar. Hoschander alternatively suggested Ishtar-udda-sha ("Ishtar is her light") as the origin with the possibility of -udda-sha being connected with the similarly sounding Hebrew name Hadassah. These names however remain unattested in sources, and come from the original Babylonian Empire from 2000 BCE, not the Chaldean Empire or Persian Empire of the Book of Esther. The Targum connects the name with the Persian word for "star", ستاره setareh, explaining that Esther was so named for being as beautiful as the Morning Star. In the Talmud (Tractate Yoma 29a), Esther is compared to the "morning star", and is considered the subject of Psalm 22, because its introduction is a "song for the morning star". The tale opens with Esther as beautiful and obedient, but also a relatively passive figure. During the course of the story, she evolves into someone who takes a decisive role in her own future and that of her people. According to Sidnie White Crawford, "Esther's position in a male court mirrors that of the Jews in a Gentile world, with the threat of danger ever present below the seemingly calm surface." Esther is related to Daniel in that both represent a "type" for Jews living in Diaspora, and hoping to live a successful life in an alien environment. Since she used only rhetoric to convince the king to save her people, Esther has been interpreted as a model for a successful rhetoric of marginalized groups persuading those who have power over them. 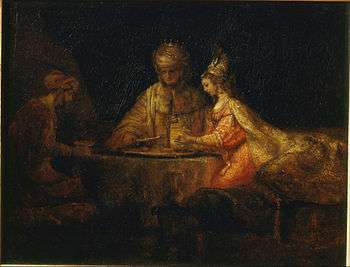 According to Susan Zaeske, the story of Esther is a "rhetoric of exile and empowerment that, for millennia, has notably shaped the discourse of marginalized peoples such as Jews, women, African Americans.” Zaeske argues that Esther speaks not only for women but for a multi-gender oppressed group and does it in such a way that “depicts rhetorical dynamics, not only of Jews living in a foreign court, but also of women coping in a society intensely hostile to their gender.” In this way, Esther’s rhetoric has been interpreted not as strictly feminist rhetoric or strictly Jewish rhetoric but rhetoric of intersectional exiled or marginalized groups. Given the great historical link between Persian and Jewish history, modern day Persian Jews are called "Esther's Children". A building alleged to be the Tomb of Esther and Mordecai is located in Hamadan, Iran, although the village of Kfar Bar'am in northern Israel also claims to be the burial place of Queen Esther. Esther is also commemorated as a matriarch in the Calendar of Saints of the Lutheran Church–Missouri Synod on May 24. She is also recognized as a saint in the Eastern Orthodox and Coptic Orthodox Churches. ↑ Robert J. Littman (January 1975). "The Religious Policy of Xerxes and the "Book of Esther"". The Jewish Quarterly Review. ↑ A descendant of the Amalekite people, of King Agag, whom King Saul of Israel was commanded by the prophet Samuel to utterly destroy because of their wickedness; but Saul chose to spare their king instead. (1Samuel 15:1-33) Haman's hatred of the Jews may have had its root in this event. ↑ Barton, John; John Muddiman (2001-09-06). "Esther". The Oxford Bible Commentary. Oxford University Press. ISBN 9780198755005. ↑ Huehnergard, John (2008-04-10). "Appendix 1: Afro-Asiatic". In Woodard, Roger D. The Ancient Languages of Syria-Palestine and Arabia. Cambridge University Press. pp. 225–246. ISBN 9781139469340. ↑ Rahmouni, Aïcha; Ford, J. N. (2008). "Section 1, The Near and Middle East". Divine Epithets in the Ugaritic Alphabetic Texts. Brill. p. 86. ISBN 9004157697. ↑ Offord, Joseph (April 1915). "The Deity of the Crescent Venus in Ancient Western Asia". Journal of the Royal Asiatic Society of Great Britain and Ireland: 198. JSTOR 25189307. ↑ Tidball, Dianne (2001). Esther, a True First Lady: A Post-Feminist Icon in a Secular World. Christian Focus Publications. ISBN 9781857926712. ↑ Kuyper, Abraham (2010-10-05). Women of the Old Testament. Zondervan. pp. 175–176. ISBN 9780310864875. ↑ Zaeske, Susan (2003). "Unveiling Esther as a Pragmatic Radical Rhetoric". Philosophy and Rhetoric. 33 (3): 194. ↑ Vahidmanesh, Parvaneh (5 May 2010). "Sad Fate of Iran's Jews". ↑ Schaalje, Jacqueline (June 2001). "Ancient synagogues in Bar'am and Capernaum". Jewish Magazine. ↑ McDonald, Lee Martin (2006-11-01). The Biblical Canon: Its Origin, Transmission, and Authority. Baker Academic. pp. 56, 109, 128, 131. ISBN 9780801047107. Fox, Michael V. (2010-04-01). Character and Ideology in the Book of Esther: Second Edition with a New Postscript on A Decade of Esther Scholarship (2nd ed.). Eugene, OR: Wipf & Stock. ISBN 9781608994953. Sasson, Jack M. (1990). "Esther". In Alter, Robert; Kermode, Frank. The Literary Guide to the Bible. Harvard University Press. pp. 335–341. ISBN 9780674875319. White, Sidnie Ann (1989-01-01). "Esther: A Feminine Model for Jewish Diaspora". In Day, Peggy Lynne. Gender and Difference in Ancient Israel. Fortress Press. ISBN 9781451415766. Grossman, Jonathan (2011). Esther: The Outer Narrative and the Hidden Reading. Eisenbrauns. ISBN 9781575062211. "Esther". New International Encyclopedia. 1905.